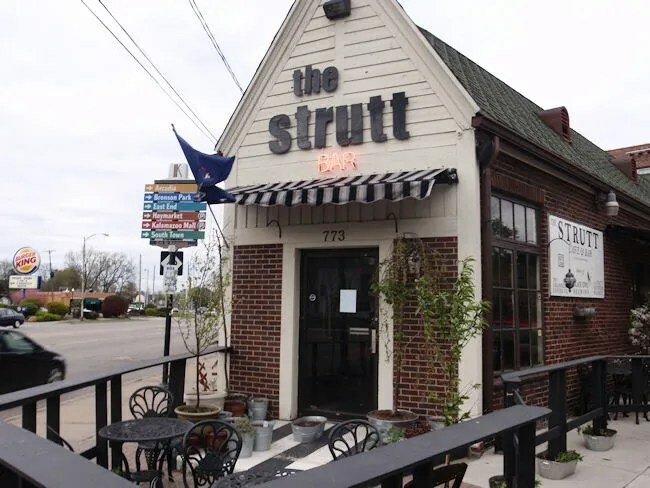 I never thought of turning to the Western Herald for restaurant reviews, but a few weeks ago, I saw a tweet for a review of The Strutt. I had heard of the place before, but I always thought it was just a dive bar that was big on live music. Boy, was I wrong. 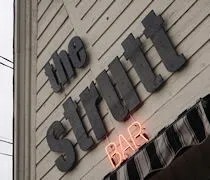 J and I headed to The Strutt for a Saturday night dinner well before the live music began for the night. The building is on the corner of Michigan Avenue and Academy Street. Those two streets create a triangle shape of land at the corner and The Strutt makes use of that design. Parking is mostly in the neighborhoods. There’s a hotel right next door with a surface lot, but I didn’t dare park there. I assume they don’t like that and I didn’t want to take chances. After 9:00, Frayed offers their parking lot for overflow parking. It’s a block or so to the southwest on Michigan Avenue. Our first dilemma was figuring out how to get in the place. We walked around to what appears to be the front, but that door is locked because it would open right on to the stage. We eventually noticed a door on the side on Academy Avenue. When I pulled on that door, it opened and brings you into the back of the space. We walked in and sat down at a table. The space is kind of what you would expect at a dive bar. The floors are unfinished hardwood and the tables and chairs are all mismatched. At a table of four, there are four different chairs. I don’t think one piece of furniture matched in the whole place. At this point, we weren’t really sure what to do. A lot of the other people had food and drinks so I knew they were serving, but I wasn’t so sure of the process. We sat there for a few minutes then I went up to the bar/counter and asked if they did dinner. The girl behind the counter handed me a couple menus that I took back to the table to look over. The menu is not at all what you would expect. Again, I was thinking dive bar. It’s not a dive bar. It’s more of a coffee house with a liquor license. The food is much ecclectic than regular pub food and they have a number of coffee drinks and pastries to go with the menu of sandwiches and pizzas. As we were looking over the menu, that barista came over and made sure we knew that ordering was done at the counter. There was no table service. By this point, I had figured that out, but it’s still a nice gesture. For a while, it was somewhat of an awkward feeling not knowing what to do. After we made our decision, we headed back to the counter to order. J started things off. She got the sandwich known as That One Chick. 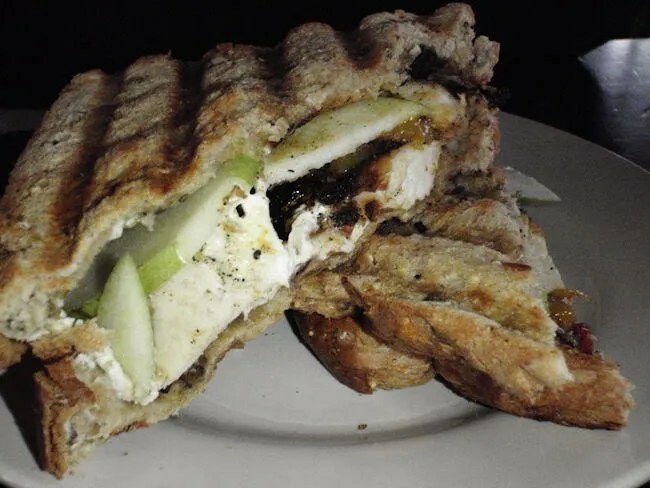 It’s a panini that consists of sliced blackened chicken breast, Granny Smith apples, goat cheese, and a mango and dried cherry chutney. She couldn’t stop raving about it. The chicken was actually blackened and just a little bit spicy. The Granny Smith apples were a good contrast to that. The goat cheese added the creamy element for a different texture and the mango chutney provided a little bit of sweetness. She called it one of the best sandwiches she’s ever had. The sandwich came with a few blue corn tortilla chips on the side. Not a lot, but just enough. To drink, she got a Chai Milkshake. She wasn’t planning on getting anything cold, but when she saw that, it was too hard to pass up. I ordered El Cubano. As you can probably guess, it’s The Strutt’s take on a Cuban. The sandwich is served on a really crusty fresh baked roll. 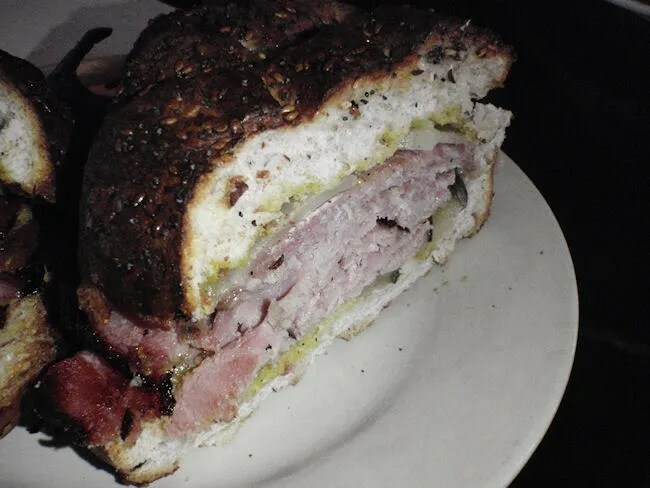 It’s stuffed with grilled Black Forest ham, roasted pork, genoa, Swiss cheese, yellow mustard and a dill pickle. There was no way I was going to be able to fit this sandwich in my mouth. The bread was piled pretty high with meat and the bread had a really hard toast to it. The ham had a delicious grilled crust on the outside and the whole thing was just delicious. I haven’t had a lot of Cubans, but this is the best I’ve ever had. It was a little tough to eat because the grilled roll was just so hard. My sandwich also came with the blue corn tortilla chips and I got a PBR to drink. Our bill was just over $23. We noticed a sign that said cash only near the cash register, so we both dug to find the money. I noticed later, on The Strutt’s website, that they do take credit if the bill is over $15, so we would have been ok, but we had enough cash.